Lots of free parking available to all who visit the Huntington and its Rose Garden Tea Room. 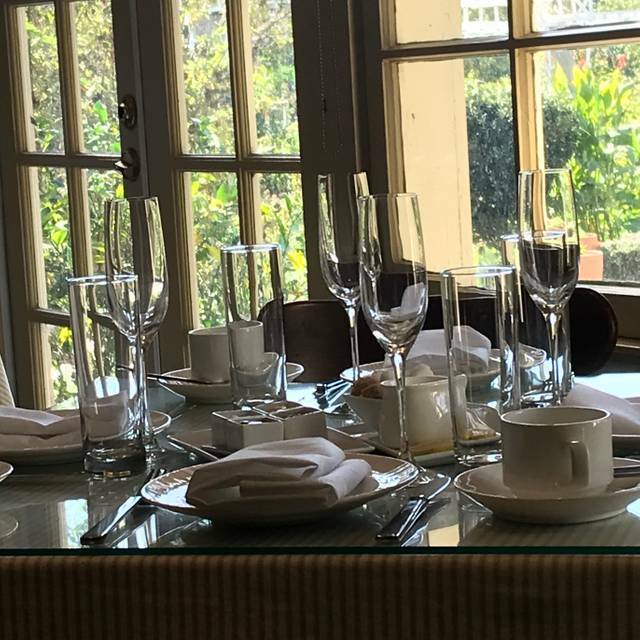 Set within the historic Huntington Rose Garden, the Tea Room is now managed by Bon Appétit Management Company, and offers traditional tea table service, with fresh offerings made from scratch with local, seasonal, and sustainable ingredients. 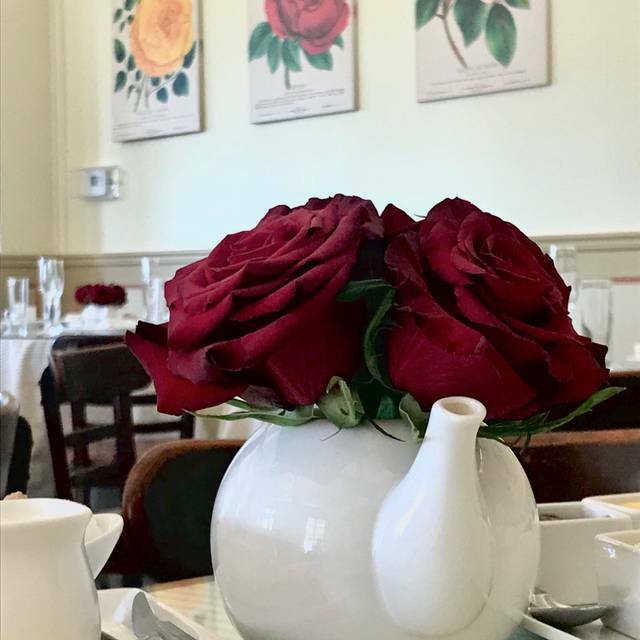 The Rose Garden Tea Room's elegant and memorable experience is inspired by the aristocratic tradition of English tea service with a distinctive California twist. Nibble on scones, delicate finger sandwiches, and seasonal desserts, accompanied by a selection of herbal and Fair Trade teas or sparkling wine. We are happy to try and accommodate dietary restrictions. Reservations strongly recommended; walk-ins accepted on a first-come, first-served basis. For private events or large party reservations over 8 guests, please email, maritza.martinez@cafebonappetit.com. 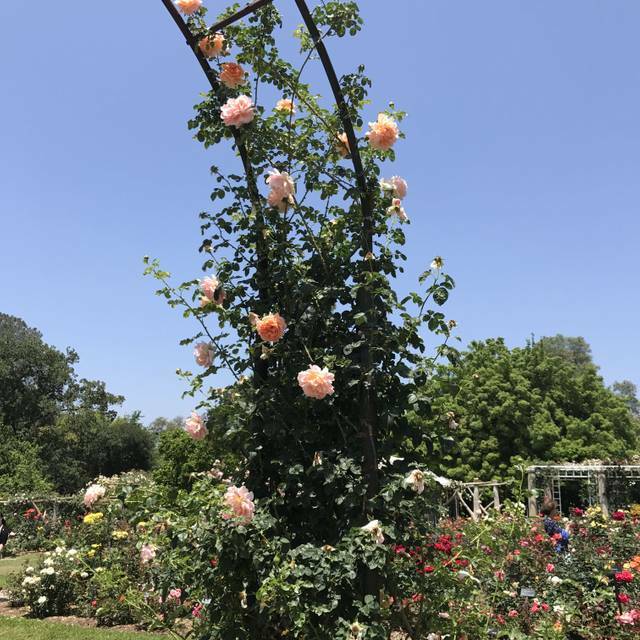 Set within the historic Huntington Rose Garden, the Tea Room is managed by Bon Appétit Management Company and offers table service instead of a buffet, with fresh offerings made from scratch with local, seasonal, and sustainably sourced ingredients. Please keep in mind that admission to the grounds is required for all guests. 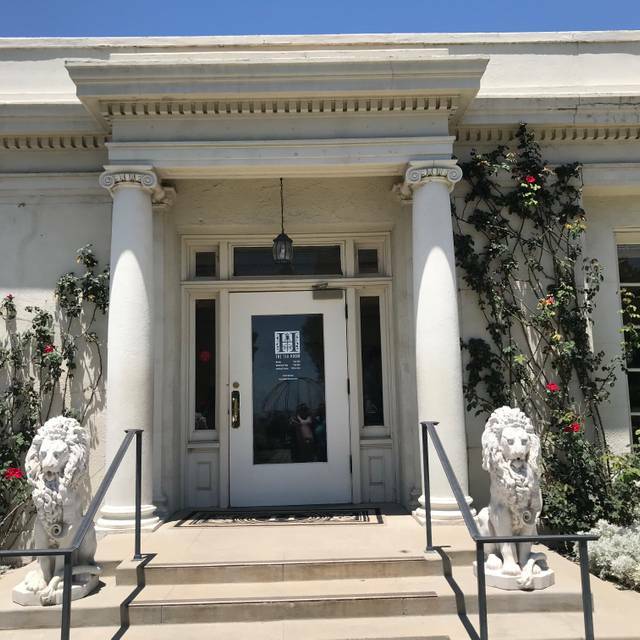 The Tea Room's elegant and memorable experience is inspired by the aristocratic tradition of English tea service with a distinctive California twist. Nibble on scones, delicate finger sandwiches, and seasonal desserts, accompanied by a selection of herbal and Fair Trade teas or sparkling wine. We are happy to accommodate dietary restrictions. Reservations strongly recommended; walk-ins accepted on a first-come, first-served basis. Included in the Traditional Tea and the Huntington Rosé Tea service selections. We have special menus available upon request to better serve our guests with dietary restrictions and preferences. Please ask your server for our menu made without gluten-containing ingredients or our vegan menu. Experience the whimsy of The Huntington's flora and botanicals. Savor notes of jasmine, fruit, vanilla, and bergamot. Inspired by Arabella Huntington's most beloved flowers, this blend's floral essence and smooth finish delight the senses. Robust with flavor, this traditional blend of organic black tea brews smooth and malty, with a clean finish. Laced with notes of zesty bergamot and French vanilla, this organic high-grown estate black tea has a velvety cream finish. This blend of green tea is subtly sweetened with tart and tangy raspberries and essence of pomegranate. True to tradition, this organic Chinese green tea is scented with jasmine blossoms for a bright and floral brew. Tossed with toasted rice kernels, this Japanese sencha has a unique lightly roasted popcorn finish. Green tea leaves rolled into small spheres resembling gunpowder produce a grassy infusion with a smoky finish. This refreshing organic blend of spearmint and peppermint is harvested from the coasts of Oregon and California. Light and mellow but complex, this tisane finishes with hints of cinnamon, apple, and lime. A soothing organic medley of invigorating citrus and spicy ginger, this blend is a lovely complement to any meal. Soft, floral, and sweet, this unique herbal blend creates a beautiful pink-hued brew with delicate fruity notes. This pu-erh tea heats things up with a rich blend of cinnamon-drenched chocolate and gentle heat from chili flakes. Delectable with notes of honey, caramel, and fresh baked pear, this dessert infusion is sweet and flavorful. This caffeine-free blend infuses enticingly sweet and tangy flavors complemented by the hint of fresh cream. Fresh, fruity, and complex in flavor, this exotic medley has a floral aroma with notes of ripened mangos and passionfruit. We were celebrating friends birthday. Everything was great. But the food was just okay. The afternoon tea used to include an unlimited refresh on what you were served just once. It used to be a center buffet and you could get seconds on your favorite treats. Instead they brought you a tall tray with assorted treats and just one serving each. the salmon with caviar was delicious. The pepper egg tart was terrible. The cucumber tea sandwich was refreshing but small. The delved egg cup was tasty just small. The cream Jello thing with rose infused jelly on top was an odd combo. The Chocolate cup with decorative bunny coin was okay the cream center was tasteless but the fresh raspberry in center helped. I ordered the cheese board which was also lacking for 12 dollars. The service is fabulous. Our server David was kind and patient and very attentive even though it was very busy in the tea room. Not inexpensive but lovely for that special occasion! Pricey, but very nice - my wife loves this place, so it is a good place to go for special occasions. In this case, we went for Easter - had a 10:30 reservation, so we beat the crowd, but it filled up very quickly. The tea is nice and they are good about topping off the tea, rather than letting you run out. The gardens are the highlight, especially at this time of the year, when the roses are blooming and the baby geese are around (you have to know where to look). Celebrated a friends birthday she was busy so we couldn’t arrive earlier then 2:30; not giving us enough time to enjoy the park for the price of admission. They really should have a discounted rate for any one that arrives after 2pm since it closes at 5pm. Went with a group of ladies to celebrate my bridal shower. I’ve been to a few tea houses so from that perspective this is my opinion. The carpet in this place needs to be upgraded, or at least put down some linoleum flooring. There was none to greet us when we got there. The host’s attitude was hi ‘n’ dry. She seemed to be the manager. After we were sat, our experience got better. Our waiter was nice and she explained everything in detail. Food was tasty and so were the teas. Overall a lovely tea experience but the best part is going out to explore the grounds. Great gluten free selection, it was wonderful not to have to go back and forth with the kitchen about what I could eat. It's already preset for traditional high tea. Excellent service, beautiful setting (looking out the windows into the gardens). The setting is lovely, service is wonderful. We thought the savory and sweet scone choices were delicious- perfect size, texture and flavors. Enjoyed all the sandwiches- especially the salmon. The quiche and egg bites were amazing. Nice dessert selection too - appealed to everyone in our group. We all enjoyed our tea selections - I even purchased a bag of the seasonal Aztec Spice tea for home enjoyment. Nice fun dinning option for a special occasion. Great service. Such a wonderful place! I’ll keep coming back by myself and with friends! A charming lovely experience Atmosphere and wait staff make feel special. Tea and food delightful. Lovely. Nice interlude. The scones were the best. I think the Sandwiches were good, however, I would have like a little more flavor, don't get me wrong they were good, just could have been a little more intense. The service was efficient and friendly. All in all a very nice experience. An all around wonderful experience. We were a small gathering celebrating a milestone birthday. The selections from spirits, tea, to desserts was perfect. The ambiance and service made for a perfect day! Other than the noise level was loud everything else was very nice. It would be nice to have outdoor seating available too so you could really enjoy the gardens while having your tea. It didn't quite live up to my expectation but still a fun experience. But like you say in your advertising "with a California Twist" I guess that means crowded. It was lovely, but pricey being you have to pay to get into the grounds also. Nice experience though. 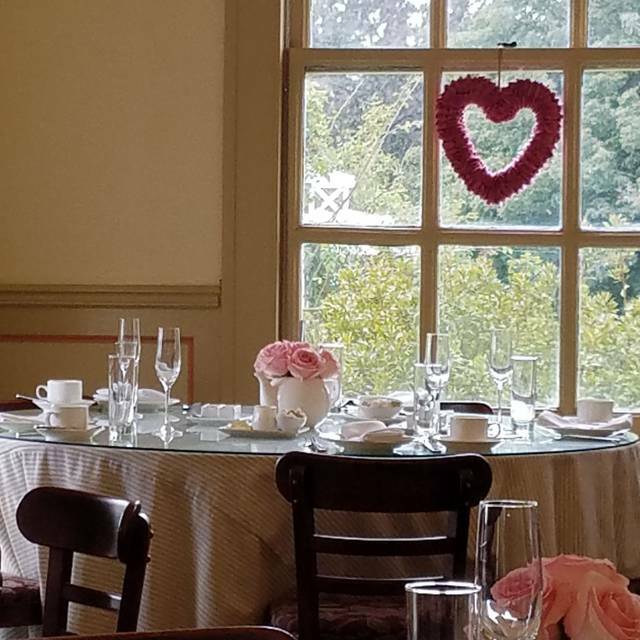 My friend and I always enjoyed having tea at the Rose Garden Tea Room; however, I was very disappointed and dissatisfied this past weekend. The noise level was very high, especially because there a lot of children and there was a baby that would not stop crying. The food was overpriced considering that you also are required to pay entrance to The Huntington in addition to paying for tea. The chairs were chipped. The restroom needs to be updated. At least a minimum dress code should be required. Shorts and sleeveless T-shirts should not be allowed. Because of all of the above, our experience was not an enjoyable. I do not plan on coming back again to the Rose Garden Tea Room. 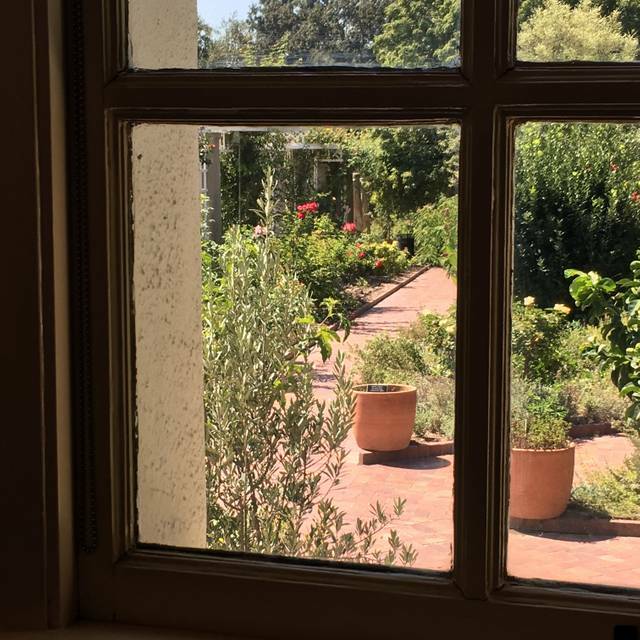 I do, of course, enjoy tremendously visiting The Huntington Library and gardens! I have been coming here for 30 years. This review was difficult to write. I love the servers, food is good but today there were 2 little brats who screamed continuously for over an hour. The tea experience was completely ruined. Management raises the prices, made it a more elegant served tea yet they allow children to scream and ruin everyone’s meal. You need to make this an adult only tea. Little children should not be allowed. 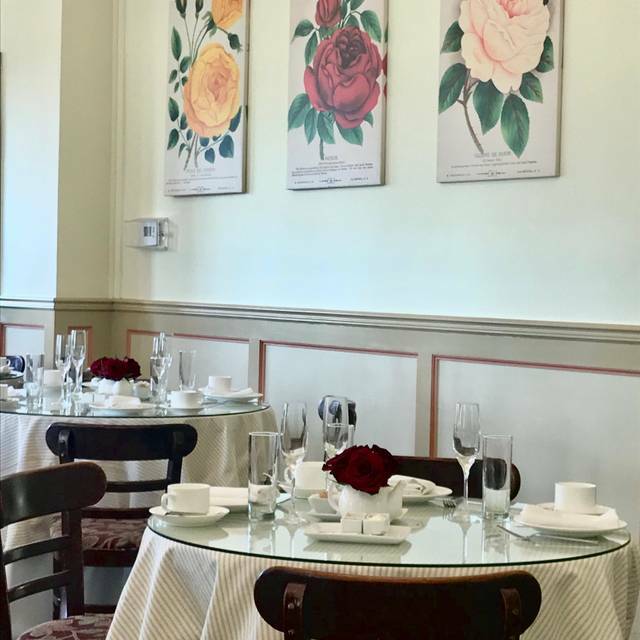 While it no longer offers buffet-style tea time, the Huntington's Rose Garden Tea Room still retains the wonderful feeling of being able to fill yourself with good food and wonderful tea! I loved that it is individual tea pots, which gave us lots of choices of tea to try between the 6 of us there. The scones were great, but I do miss when they would give us some to take home . Overall, we had a wonderful experience and would definitely be going again! Birthday celebration for my daughter. It was a very nice experience! Delightful way to round out a day at the Huntington. First time having high tea and the experience was excellent. Our sever walked us through the menu and was able to accommodate our dietary needs. 3/4 of our party was vegan and gluten free. The options for this diet were delicious. Very filling as well. The 'Caramelized Pear' tea was a winner with everyone at the table. Definitely coming back! Food and tea were luxurious and very good. But the chairs and tables were too narrow and uncomfortable. However, I was satisfied with eating in a historic building. Overall service was good . The time given to us was one and a half hours, but after one hour, I felt too much pushing. Especially the person clearing the tableware was too push to feel bad. But it was a place I would recommend to go at least once. My girlfriends and I had a very nice time. The only thing we did not like was the fact that we had to pay $29 admission in ADDITION to the tea. Great selection of different types of food. The children’s menu was well liked by my kids. Plenty of food to eat. Tea was outstanding. The tea room is something I think any person should experience. The food and tea was amazing. The servers are attentive and pleasant. We made a reservation which I would highly suggest. A gem in the middle of the wonderful Huntington Park. Simple, quiet and very "English" tea service. A must try. Too noisy for a conversation. Very disappointed with the entire experience. 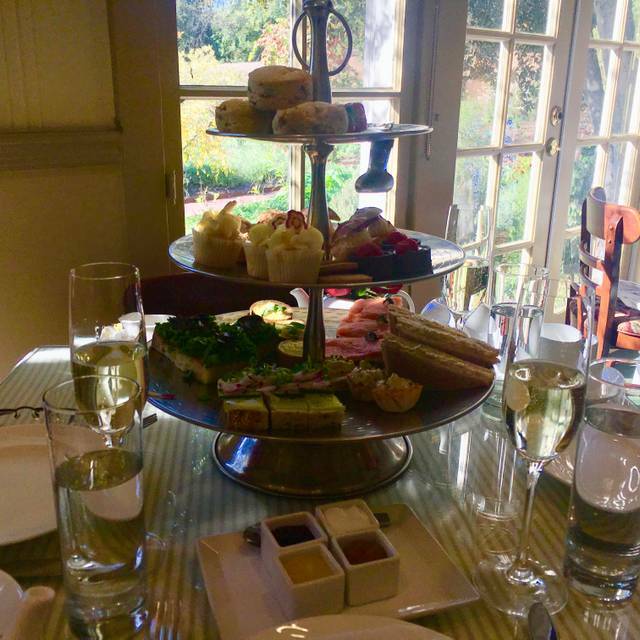 My husband and I have enjoyed High Tea many times in The Huntington's Rose Garden Tea Room. It's a favorite place to celebrate birthdays, anniversaries; and to entertain out-of-town guests. Service is always friendly, efficient. And the food and tea selections delicious. Was a beautiful high tea experience, with all the food being delicious and the teas being outstanding. Also the service was impeccable! A great experience overall and would highly recommend doing this! The food offered as part of the afternoon tea has definitely improved. The tea sandwiches were fresh and flavorful. The cheddar cheese scones were yummy; the regular ones were ok....good not fabulous. The sweets were also middling. Service was lovely....friendly and efficient...given the full crowd scene I appreciated the servers calm and serene attitude. We sat in the back room which had a calmer feeling than the uber busy front room. Had a great time...but take the time to walk around the gardens because it would be a hefty price for just tea alone. We’ve been coming to the tea oil for 10 consecutive years to celebrate a birthday in April. The food was no at all pleasing. Sadly, we didn’t eat most of it. I don’t mind spending money on good food; however, our bill was $140 for 3 and NOT worth it!!! We will no longer be frequenting he tea room. We will either go someplace else or eat at another restaurant at the location. What a wonderful experience! We sampled some of the seasonal teas and we were not disappointed! The food was delicious and way more than I could eat. I enjoyed having a glass of sparkling wine with our meal. Such fun! Very lovely! It was quite crowded & our table wasn't ready on time, but we understand that due to the Shakespeare Day festivities, attendance was quite high on Saturday. It would have been nice had the rose bushes been in full bloom, but we understand why they weren't. All in all, it was a very lovely tea! If you like Tea services, the one at the Huntington is very worthwhile. 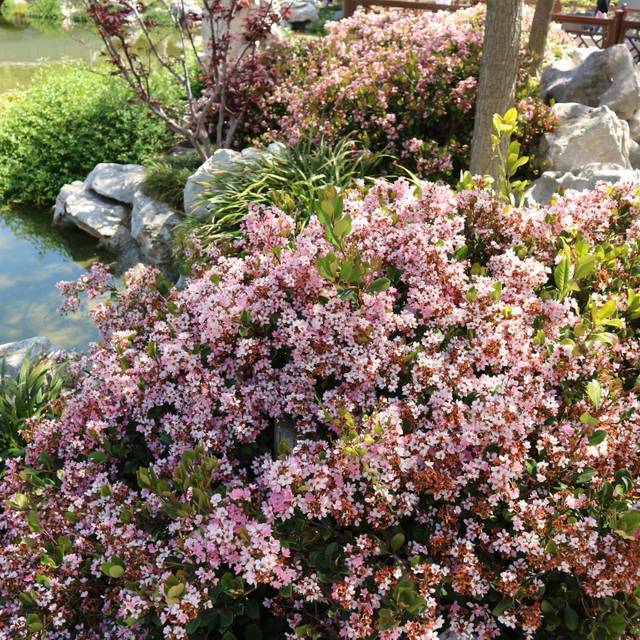 There are various selections of teas, excellent dishes, beautiful views, and very friendly and attentive staff. Beautiful gardens, art, books, and exhibits are on the grounds for your post-prandial or pre-prandial enjoyment. Highly recommended. This was our first time at this venue, but our second tea time experience. The decor and table settings were too plain and simple, but at least the views of the surrounding gardens helped make up for it. The food was not terrible but not great either. The service could use some definite improvement as it was our first time there and they did not explain to us how things worked and/or what to expect. The value was ridiculous considering that you are stuck paying at least $37/person to only get to try ONE tea. I was highly disappointed with this expensive experience and would not do it again at this location. It was a birthday tea for my daughter’s fifth birthday. She deemed it “the best birthday ever!” So I would say it was a wonderful experience overall! Would recommend only because of the setting. But in addition to the Tea, you have to pay to enter the Huntington!